Samsung has launched Galaxy J6 Smartphone which is the first smartphone in Galaxy J Series to come with Infinity Display. 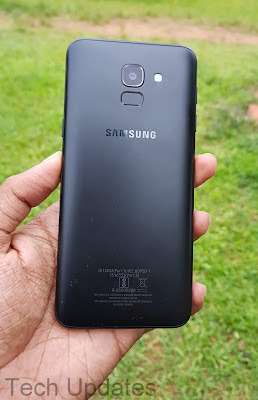 Here are top Reasons Not To Buy Samsung Galaxy J6. Samsung Galaxy J6 is powered by 1.6GHz Octa-Core Exynos 7870 14nm processor with Mali T830 GPU which is almost 2-Year-old processor used in Galaxy J6 2016 and almost every Mid-range phone. Samsung Galaxy J6 is packed with a 3000mAh battery which comes with 5V 1A Charger takes almost 3 Hours to charge fully, Forget quick Charge Samsung should have at least provided 5V 2A Charger in the box. As always Samsung has skipped many sensors in Galaxy J6, No Auto brightness sensor, Sensors on J6 include Accelerometer, Fingerprint Sensor, Hall Sensor, Proximity Sensor. Samsung Galaxy J6 is priced at Rs 13,990 for 3GB RAM and Rs 16,490 for 4GB RAM. It offers Good Display, Decent Camera, Dedicated MicroSD Card. Galaxy J6 alternatives are Redmi Note 5, Realme 1, Honor 7X, Honor 9 Lite, Asus Zenfone Max Pro M1, Xiaomi Redmi Note 5 Pro. Samsung Galaxy J6 gets another Price drop in India 3GB RAM model cost Rs 12,490 whereas 4GB Now Cost Rs 13,990.